Sonny and Dexter are 8 year old male Boxers. These brothers adore each other and they need to go to a new home together. Dexter is partially blind but can see shapes. This doesn’t stop him enjoying his walks though, particularly with Sonny as his guide. They both walk nicely on the lead. They have lived with cats before and so would probably be fine again. Dexter is a little unsteady on his back legs but manages really well – especially when wearing his harness. 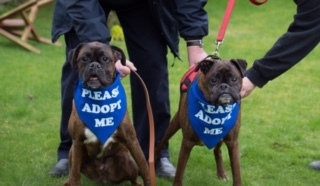 In summary, Sonny and Dexter are friendly dogs who are happy and affectionate and who will make lovely pets.